Posted By:Unknown | At:12:41 AM Be the first to comment! SELMA, Ala. (AP) – Thousands of marchers marked the 46th anniversary of the "Bloody Sunday" voting rights confrontation in Selma. Activists staged the annual commemoration of the historic demonstration by walking across the Edmund Pettus Bridge over the Alabama River on Sunday afternoon. Participants included U.S. Rep. John Lewis of Georgia, who was injured in the melee in 1965, as well as Senate Majority Leader Harry Reid and the Rev. Jesse Jackson. Law enforcement officers attacked civil rights demonstrators marching toward Montgomery across the bridge on March 7, 1965. 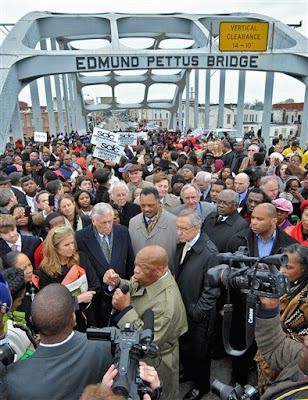 The movement only grew, and the Selma-to-Montgomery march was held later in response. The march is credited with helping build momentum for passage of the landmark Voting Rights Act of 1965.